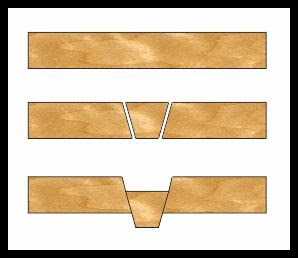 Tray Scroll Saw Pattern. Updated Hour Meter for your Scroll Saw. I received and email from John Fiorani of the Carolina Scrollers club this morning. 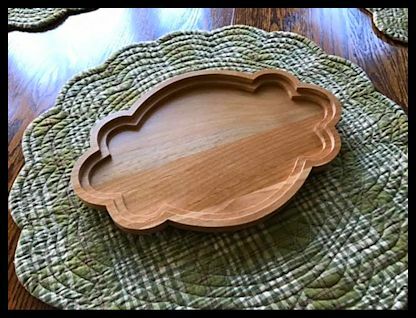 He sent me a picture of a tray he had made from a modified pattern of mine. I really liked what he had done so I ask him if I could share his idea. The tray is the same shape as a box I published a few days ago. The tray is a bevel cut design. For those of you who may not be familiar with a bevel cut here is a quick explanation. When you tilt the saw blade and make a cut, it forms a plug shape. 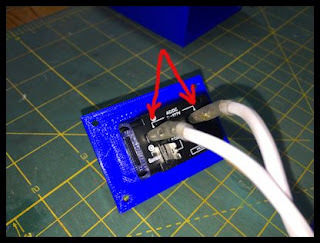 Depending on the angle of the tilt, thickness of the board and thickness of the blade the plug will fall into the opening at a different depth. You see this in the diagram below. Complete instruction on how to set the angle for a good fit is included in the pattern book. 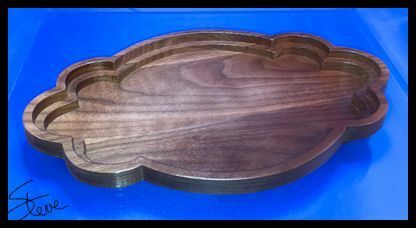 In the picture above I used a #5 blade, 1/2" wood and a 3 degree tilt. Your may vary so do the test cuts in the included instructions. Here is the picture John sent of his tray. Thanks for the idea John. I'm sure several scrollers will enjoy making this project. 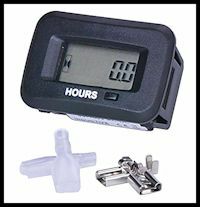 After I made the hour gauge for my scroll saw the other day a reader sent me a link to a digital hour meter that has extra features. I ordered one and it came in today. 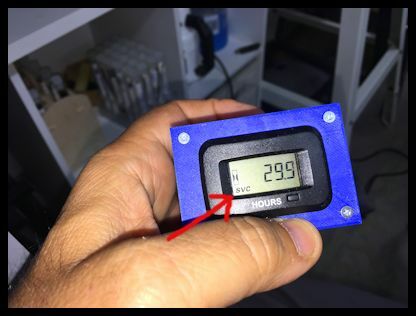 Here is the link to this meter. The old analog gauge is on the left. I printed a smaller enclosure for the new digital gauge. There are three posts on the new gauge. 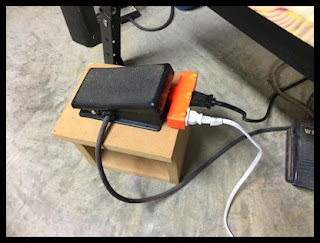 You want to apply the power cord to the two posts that are horizontal. See the instructions that came with the gauge for details. This is 120 Vac so if you are not comfortable around high voltage get some one who is to wire it up. 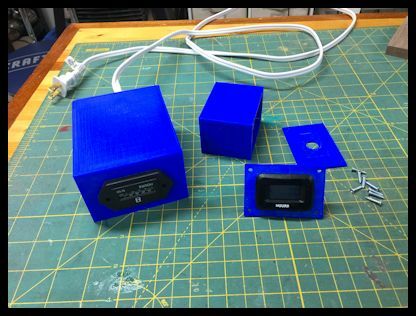 If you would like to have the 3D printer files for the enclosure just email me. You can buy a plastic enclosure or make one from wood. 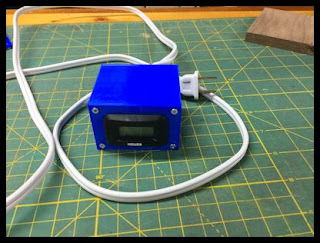 Just as with the other hour meter I made you will have to plug this into your foot switch using an adapter. This hour meter only runs when 120 Vac is applied. The meter counts when the blade is moving and stops when the blade stops. This meter has three timers. One is the total run time and cannot be reset. When power is applied the little hour glass will flash letting to know it is counting. 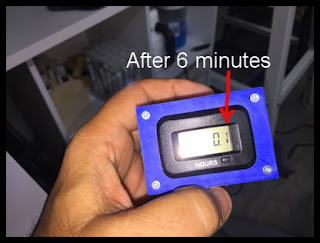 The digit after the decimal point is 10ths of an hour and will turn over after six minutes. The digits to the left are hours. I ran the saw for six minutes and the counter advanced .1. This will continue when power is applied the next time and keep a running total. This meter cannot be reset. 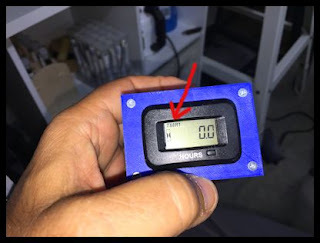 If you do a short push and release of the button the meter will go to the timer1. 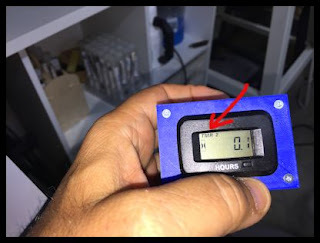 This counter works the same as the total meter except that it can be reset. Read the instruction to learn how to reset. Timer2 works just like timer1 and is also reset-able. This could be handy if you are working on more than one project. 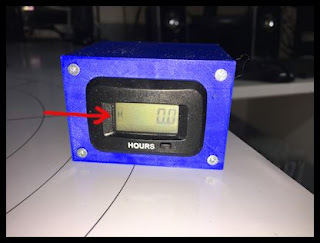 The last function is a service count down timer. The default is 30 hours but can be changed. If you do routine maintenance at a schedule you can use this to keep track of the hours until service.